Today I was once again a guest columnist at Barron’s, penning Low Volatility: How to Profit From a Quiet VIX for the venerable Barron’s options column, The Striking Price. While this is my thirteenth turn as guest columnist, much to my surprise this is the firsts time that “VIX” has appeared in the title. Since everyone seems to be talking about how low the VIX is, whether the VIX is broken, etc. I thought it would be an appropriate time to share some of my thoughts on the subject. In the Barron’s article I make the point that while mean-reversion trades when the VIX spikes higher has been a viable strategy over the years, the mean reversion approach has not fared nearly as well when the VIX dives substantially below its long-term mean, which happens to be just a shade over 20. As the chart below (monthly bars of the VIX) shows, most significant VIX spikes tend to be short-lived, but the VIX can remain well below the 20 level for multiple years in a row. Just look at 1994 – 1996 and 2004 – 2007 and think about the long-term viability of buying VIX calls or putting on a similar long volatility position during a period like this one, armed with the knowledge that eventually the VIX will have to revert to its historical mean. In fact, there have already been two instances (1990 – 1994 and 2002 -2007) in which the VIX declined steadily for a period of at least four years. 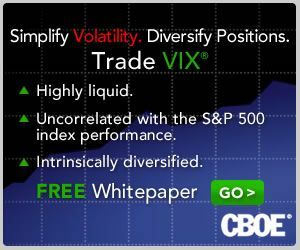 With the most recent peak volatility in August 2011, it is not unreasonable to think about the possibility of volatility continuing to decline or at least tread water through at least August 2015. While the Barron’s article does not give my options trade idea a label, it is a ratio risk reversal that contemplates selling VIX June 14 puts and (perhaps) investing the proceeds in twice as many VIX June 17 calls.